This evening I used up the last of Sunday's Mexican Style Meatloaf. As I was driving home from work, I pondered what to do with it. Suddenly, I envisioned a big plate of nachos! LOL So that's exactly what I made. But these weren't just any nachos...they were "Not-chos" as in nachos without chips! While that might be stretching it a bit, nonetheless it was delicious and so quick and easy to make and an outsandingly perfect way to enjoy the leftover meatloaf. It would be a great way to use up leftover taco meat, too! Here's how they went down...or piled up, depending on how you look at it. I first chopped up the remainder of the meatloaf and browned it in a touch of oil in a nonstick skillet. It browned up nicely since it had shredded pepper-jack cheese in it. While the meatloaf browned, I thinly sliced up a small head of romaine lettuce and placed it as my "nacho base" on the plate. I sliced green onions, baby Roma tomatoes and avocado. 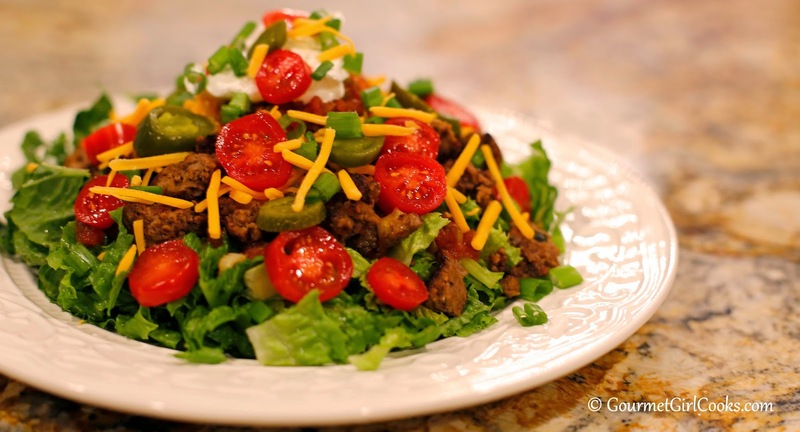 I piled the browned chunks of meat on top of the shredded romaine, topped it with shredded sharp cheddar cheese, avocados, spoonfuls of fresh salsa, and then piled on the tomatoes, green onions, sliced jalapenos, and sour cream. These were "Not-chos" you ate with a fork...and a smile! LOL I snapped a quick photo for you to see below. Enjoy! And besides ... it looks delicious!